This piece is a stone relief, meaning it would be challenging to replicate in different mediums. Due to its three dimensional nature , the figures cast a slight shadow which emphasizes which characters in the carving are situated in the front or the back of the piece. The artist took the rough texture of the stone and created a smooth, curved piece in contrast. This piece is highly stylized, simplistically depicted with textured detailing in some areas such as in the hair and in the wings of the sun-platform. Although minimalist, the piece is coherent and interacts well with its surroundings. This stone relief was discovered on the side of the Tell Halaf temple which is located near the modern day Turkish border. The Tell Halaf area was said to be founded in 6,100 BCE and abandoned in 5,400 BCE, therefore this piece would have been created at some point during that time. The relief depicts Gilgamesh, King of Uruk. Gilgamesh was said to be two-thirds God, and one-third man. He killed the bull of heaven, Gugalanna, and the guardian of the Cedar Forest, Humbaba, with his companion Enkidu, which lead him to achieve immortality. Gilgamesh was revered as a God in his kingdom, saving his subjects from Gugalanna. 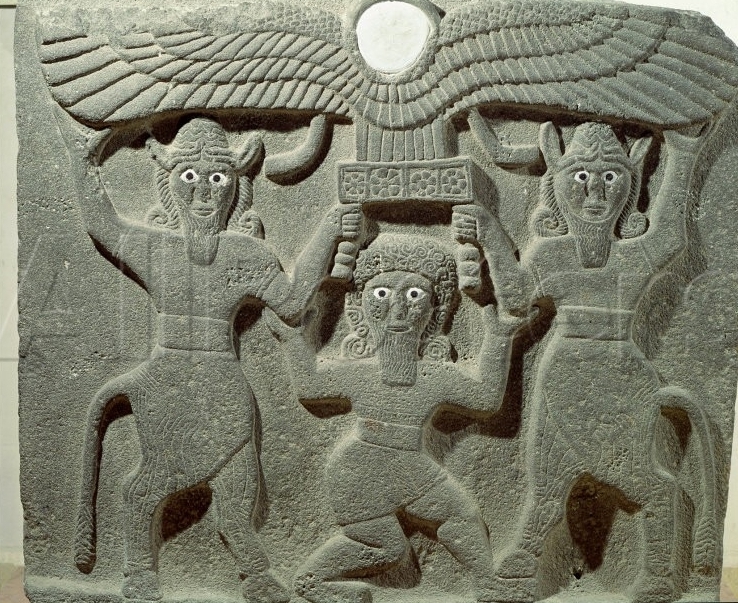 In the relief, Gilgamesh is depicted holding a winged sun disk above his head, supported by two hybrid bull-men. This sun disk is symbolic of divinity, royalty, and power.